ITF Zimbabwe asked for a seminar in 2017 to stabilise and develop the work being done at the seminars in 2015 and 2016. Starting with three clubs in 2015 the Association has now 6 clubs with 5 of them at Harare (Zimbabwe Capital) and one club in the province. The Association grows slowly but steadily. African Development Team member Sabum Niklas Enander took the opportunity of his trip to Uganda to join this seminar and to assist me during the three days and his help was very much appreciated. 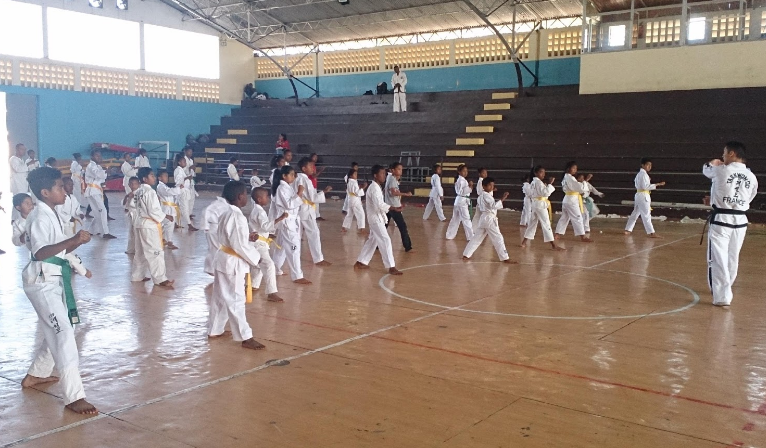 Because of him we had the opportunity to devide colour and black belts and go to more details of all facets of TKD-ITF with the result that the understanding of the sine wave and the correct stances became better and better. For many of us in Europe it is quite difficult to comprehend the fact that some participants had a 45 hours trip by bus to come to Harare for the seminar (e.g. Alexandre Mabjaia and Joshua Nhatave from Mozambique). Prince Litete from Malawi was traveling more then 30 hours by bus. After the seminar he expressed his wish to become club member in our ITF which would mean country number 14 since 2008! Said Kenedy and John Arnold from Tanzania and Maximilian Kailangana from Zanzibar arrived by plane with financial support of Sabum Enander. To save expenses and having no gym available we trained on Friday (July 14th) and Sunday (July 16th) on the grass outside of a squash hall and on a soccer field. 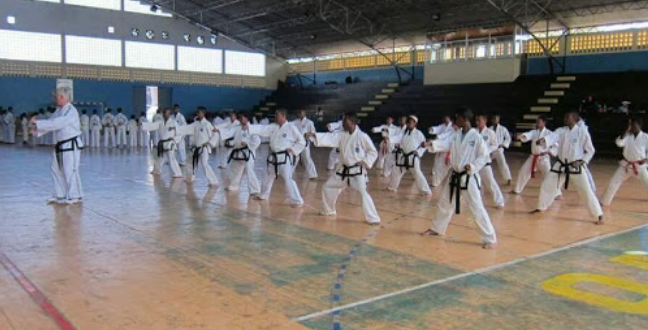 It was very warm (although it is winter now in Africa) and it was recalling me on General Choi’s words in the encyclopedia that „dojang can be everywhere under heaven“. It was a good experience for all of us (13 black belts) and two instructors. 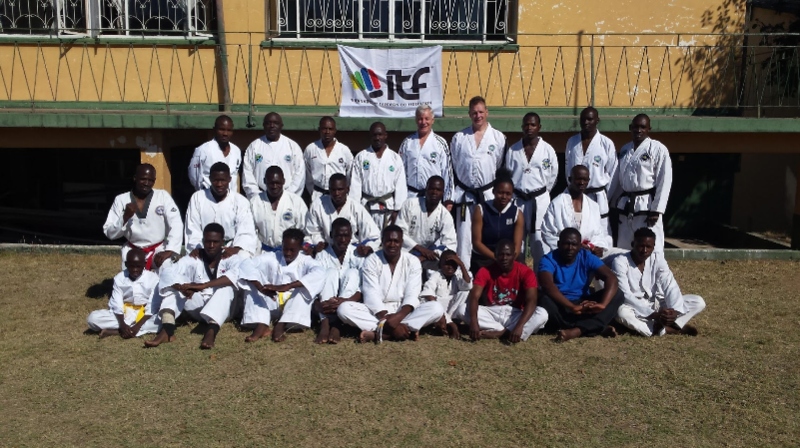 On Saturday two 1st Gup candidates from ITF Zimbabwe were promoted to 1st degree black belt and on Sunday two candidates to 2nd degree (Zimbabwe and Mozambique). The technical level is getting better but there is still a lot of work to be done. Mr. Kruckenhauser was and still is a supporter of the work in Africa. 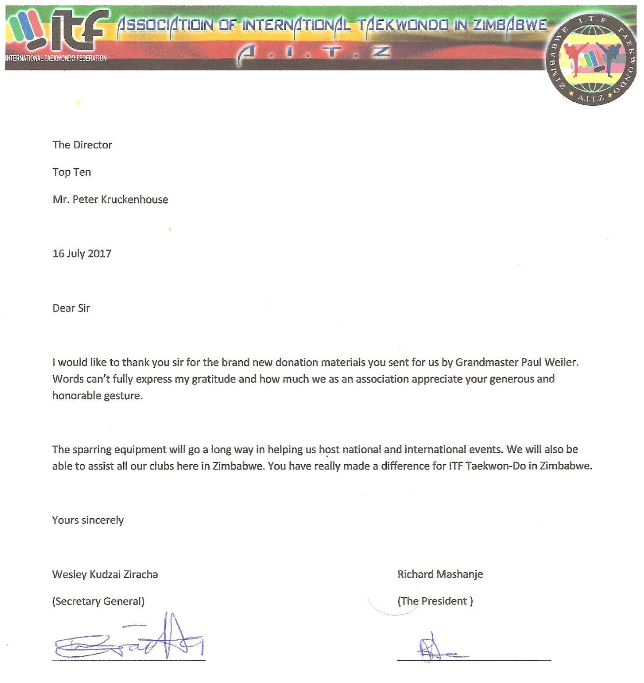 He donated brand new material (safety equipment) for Zimbabwe and it was really needed and appreciated (please compare the scanned letter below). Also my thanks goes to him and his company. Many people may have the imagination that the island of Madagascar is a wonderful place to go for holiday and they may be right – but not at Antananarivo, the capital of Madagascar. The reality is different there with many homeless people living on the streets. It hurts to see this every day. We cannot help everybody over there but we can do a lot with our TKD to give some hope and to follow the definition of GM Tran Trieu Quan that „TKD is a social tool“. 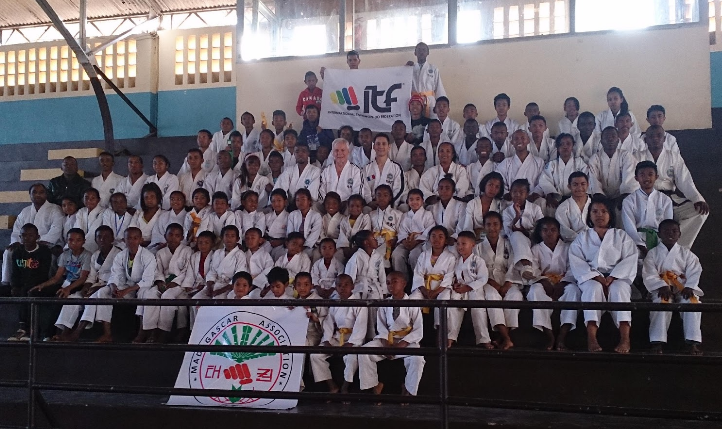 Our ITF has a special tool which will become more and more important – the Kid’s program. Almost 85 colour and 15 black belts participated at the seminar being held from Thursday (July 20th) to Saturday (July 22nd) . African Development Team member Sabum Jonathan Morris worked with me from the first day and was from big help. He did a wonderful job. 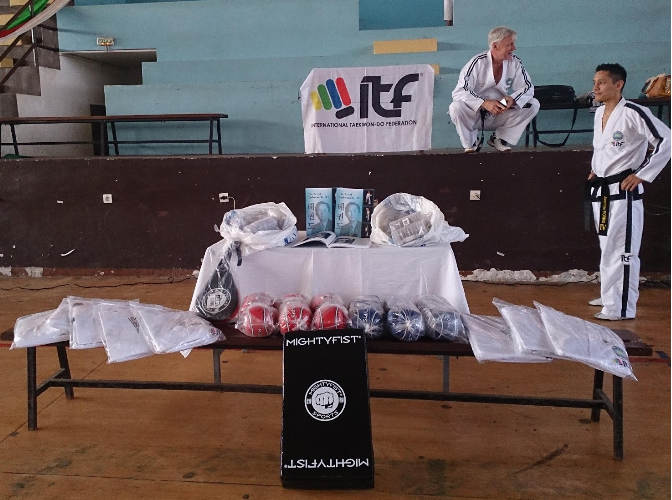 In 2015 ITF Madagascar = ITF MASS had 6 clubs and I was astonished and happy to hear that it has now 15 clubs (!) which is an amazing success and the result of the hard work of some instructors. Also the technical level became much better and I am sure that some of these Taekwon-Doin have a good future either as a instructor or as a competitor. 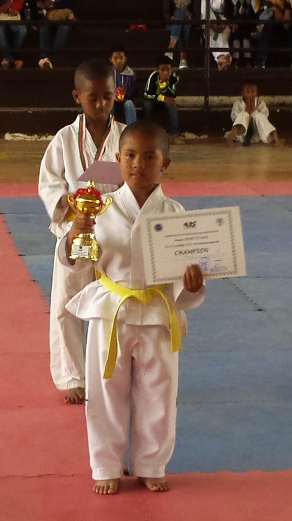 On Sunday, July 23rd, a championship has been held for pattern and sparring. It was only reduced on the finals of the championships before and was organised as a gala event. General Director of the Ministry of Sports, Mr. Jean Claude, was a special guest and very impressed about the organisation and the technical level. What a surprise that he spoke German! ITF Mass has good contacts with him and this may be very important for the future. ITF MASS has already Association recognition for Antananarivo (13 clubs) and needs another Association status in one of the provinces. The condition to receive a Association status is to have 4 clubs. Having already 1 club in a province 3 other clubs are needed. With two Associations ITF MASS can apply for Federation status which means recognition by the Ministry of Sports. This shall be the next step and could be achieved soon. Mighty fist Company Director for Europe, Sabum Jonathan Morris donated brand new material for ITF MASS.